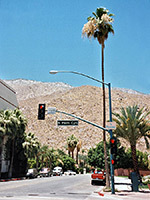 Palm Springs has an ideal, tourist-friendly location on the edge of the great deserts of Southern California, flanked by high forested mountains that provide an escape from the prevailing heat that persists for most of the year, and yet only two hours drive from the expanding metropolis of Los Angeles. The scenic surroundings and year-round sunshine are the main reasons why the town has grown into an exclusive retreat and retirement center. Palm Springs is just one part of a stretch of continuous development along the Coachella Valley which also includes Indio, La Quinta, Indian Wells, Palm Desert, Rancho Mirage and Cathedral City. A drive along the main road CA 111 passes a seemingly endless series of expensive houses, pristine shopping arcades and plush green golf courses, all interspersed by tall palm trees (every one artificially planted) and other desert plants. There are many gated estates that provide a protected environment for the rich to live in extreme comfort, although still with occasional hazards from such native creatures as rattlesnakes, black widow spiders and Gila monster lizards. (see map) Palm Springs lies close to the line of the San Andreas Fault, which passes along the middle of the Coachella Valley. The most traveled approach is from the west, along I-10 which passes through the San Gorgonio Pass, where the interstate crosses through the last of the arid hilly areas around Los Angeles and descends into the desert land that stretches for hundreds of miles north and east. North of the pass, the San Bernardino Mountains are a popular destination for hiking, camping and fishing (and skiing during winter); this range is a easterly extension of the San Gabriel Mountains and reaches heights of 10,000 feet. The pass channels and intensifies the prevailing westerly winds, and to take advantage of this the area just around the head of the Coachella Valley has been planted with hundreds of large wind generators, a rather incongruous sight amidst the sandy land. 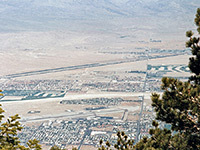 The land north of Palm Springs marks the start of the Mojave Desert - a vast sandy plain with only occasional habitation, although the immediate north east is more hilly, and here the Little San Bernardino Mountains rise to 5,000 feet and are covered with the many curious plants of Joshua Tree National Park. The San Jacinto range is the highest in California south of the Sierra Nevada; they border the Coachella Valley to the south and support a wide range of climate zones. Snow often persists on the 11,000 foot peaks until June, when the temperature 10 miles away on the valley floor may be well over 100°F. The best (and quickest) way to experience the mountains is via the Palm Springs Aerial Tramway, reached by a road that climbs up Chino Canyon, just north of town - the last section is quite steep and can be somewhat of a struggle for some vehicles in the summer heat. 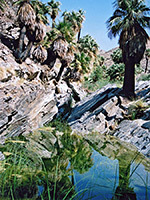 On the lower slopes, right next to downtown Palm Springs are the Indian Canyons, the main hiking location close to town. The cable car ($24.95/$16.95 for adults/children in 2015) is perfectly safe but rocks alarmingly when crossing its supporting pylons. The land on top is rocky with pine trees and bushes, squirrels and many species of birds. The temperature is around 35° lower than in the desert below, which can be followed for 50 miles on a clear day, with the rigid grid pattern of the streets extending eastwards to the horizon. Southeast of Palm Springs, the super-expensive suburbia continues 20 miles to La Quinta and Indio, then is abruptly replaced by rather uninspiring farmland and small, dusty settlements with a distinct Mexican feel. The elevation drops to sea level and below - this part of California is exceedingly hot and humid during summer, and the nearby town of Thermal is often the hottest place in the whole US. 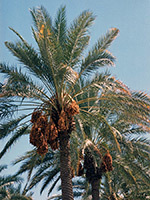 Many orchards of California dates flourish in the sunshine; some are abandoned and overgrown with many dead trees, contributing to the slightly shabby atmosphere. Just down the road from Thermal, Box Canyon Road (Avenue 66) leads to I-10 along an unusual narrow canyon with gray/brown dusty-looking rocks, in layers which are quite twisted and distorted, this being one of several places in the Palm Springs area where the effects of the San Andreas Fault are visible. CA 111 continues southeast to the Salton Sea, formed as recently as 1905 when the Colorado River breached a dike and flooded a large area of low-lying agricultural land. This lake has many white sand beaches, and may well have been a popular tourist attraction except that its waters are cloudy and polluted, with a high mineral content, have an unpleasant smell, cause extreme humidity and harbor vast numbers of flies. Generally this part of the state has little of interest to see, although a little further west, the Anza-Borrego Desert State Park does have much spectacular scenery. One of the most well reviewed hotels in Palm Springs is the 72 room Best Western Inn, located at the junction of S and E Palm Canyon Drive, 0.75 miles from downtown and right at the western edge of the suburbs. The pool and many of the rooms overlook the desert foothills of the San Jacinto Mountains, and the hotel is just far enough from the main road to enjoy peace and quiet, yet still be within a short walk of various restaurants and bars, and a 5 minute drive from the Indian Canyons. 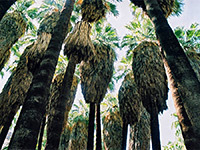 More hotel descriptions and photographs: Palm Springs, Cathedral City (5 miles), Palm Desert (12 miles) and Indio (20 miles).